Why Choose the Educational Technology - Health Professions Applications Program? Faculty in undergraduate, graduate, and post-graduate health professions, including medicine, nursing, public health, pharmacy, dentistry, and the allied health professions. 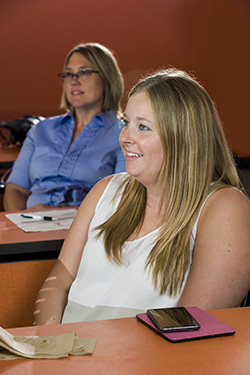 Undergraduate and graduate students in health professional programs who anticipate careers in education. Staff members in educational departments who want to enhance their understanding and skills of the new and developing technologies. Classes are taught in a condensed 7-week format, and most are entirely online. Students use technologies such as Blackboard Collaborate web conferencing, Camtasia, Weebly, YouTube, and others while in the program. Here are some of the topics and theories taught in the classes. Option 1: The requirement to take the GRE or MAT exam is waived if the applicant's cumulative undergraduate GPA (from all schools attended) is 3.0 or higher or if the applicant has a previous master's degree. All of the Educational Technology programs are currently rolling admission. Apply at least six weeks prior to the term of enrollment. EDT 8110 (Learning in a Digital World) is the required first course in the Ed Tech M.Ed. - HPA program. The attached course guide (PDF) gives a tentative outline of the semesters and terms when Ed Tech M.Ed. - HPA courses are offered. What IDOL courses have equivalents in the Ed Tech M.Ed.-HPA Program? If you previously took courses in the Instructional Design for Online Learning (IDOL) certificate program and now desire to complete the M.Ed. in Educational Technology-Health Professions Applications program, the IDOL course(s) you took can substitute for courses in the current program.